Unraveling the 2014 local election changes in the share of the vote: who suffered most from UKIP? A naïve glance at the overall changes in the share of the vote since 2010 in the graph below suggests that UKIP’s big gains came as the expense of the biggest losers, the Liberal Democrats. This is clearly one of those cases where the net changes in the share of the vote can be misleading. The opinion polls have commonly told us that Labour have benefitted primarily from the collapse of the Liberal Democrats, whereas the UKIP surge has come mostly from the Tories. If all the Lib Dem losses since 2010 were to Labour then they should be up 14 not just 5. The Green 4 point gain is likely to have largely come from the LDs, but that would still leave Labour 5 points short of where they would have been if they were simply benefitting from the Lib Dem losses. Conversely, on the right of the political spectrum, if, apart from 2 points from the BNP, all of UKIP’s 13 point rise since 2010 were from the Tories, then Conservative would have been down by 11 points, not 6 they were actually down by. This discrepancy of 5 points corresponds to the 5 points Labour seem to have been short by in the above paragraph. On this rough reckoning then, UKIP took 5 points from Labour, and 6 points from the Conservatives. So, by comparison with 2010, it looks like Farage hurt both major parties roughly equally, not disproportionately from the Tories. The story about change since 2012 also in the table is also revealing here. That shows much more clearly how Labour have fallen and UKIP risen in local election vote shares over the last two years. What seems to have happened is that between 2010 and 2012 UKIP took votes mainly from the Conservatives, but between 2012 and 2014 they have had more success in attracting Labour voters. The net effect is that the UKIP rise from 2010 to 2014 has been at similar expense to Labour and the Conservatives. This is certainly a story that fits the main pattern of change in the general election vote intention opinion polls. The narrowing of the Labour lead over the past two years has been mainly due to a Labour fall and UKIP rise. Another way of looking at this issue is to consider who suffered most in the wards where the UKIP vote share went up most. 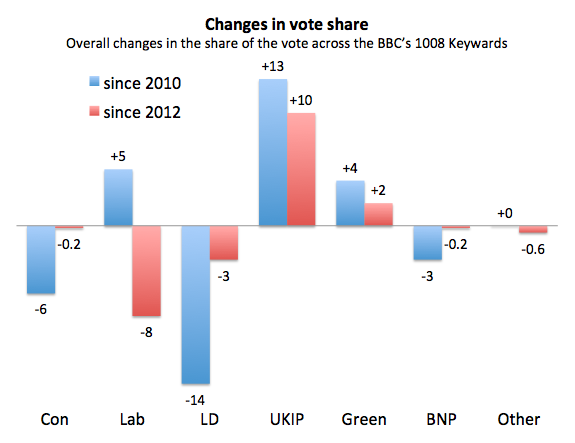 In BBC Keywards fought by all four parties, the correlation between the change in the UKIP share of the vote since 2010 and that for the Conservatives was very similar to that between UKIP and Labour: both close to -0.3. This provides further evidence that UKIP hurt Labour by about the same amount as they hurt the Conservatives. This pattern is also visible in the main source of regional variation. Across wards fought by all three main Westminster parties, UKIP were up by just 6 points in London, but by 14 points elsewhere in England: an 8 point difference. The corresponding (partially) compensating London/elsewhere differences in the performances of the Conservatives, Labour and Liberal Democrats were 2.0, 2.6 and 1.4 points respectively. These figures not only reinforce the picture of Labour suffering similarly if not more than the Tories from UKIP, but they also show an (albeit smaller) impact on the Liberal Democrats. So much for votes. What about seats? Among the 53 UKIP gains in the BBC Keywards, 22 came from the Conservatives, 19 from Labour and 12 from the Lib Dems. So a similar pattern again. Thanks to the BBC, John Curtice, Rob Ford, Jon Mellon and Rosie Shorrocks for their help with both data and analysis. Previous PostWhat do the 2014 local election results mean for next year’s general election?Next PostWhat do the 2014 European and local election results mean for the opinion polls and next year’s general election? You do not comment on the likely variable: UKIP gets votes from those who do not normally vote, as well as from two main parties. Look at poll detail and it is clear that UKIP gets 1.65 times as many votes from 2010 Tory voters as it does from Labour ones. You Gov December 2nd poll shows this. UKIP makes it very hard to predict seat numbers, esp for them. They could get 12 seats odd but polls do not normally show this, even if get 20% of the vote.